The Portland Pride Festival and Parade this weekend celebrates the LGBTQ community and this year attendees will show support for the victims of the devastating attack in Orlando, Florida. 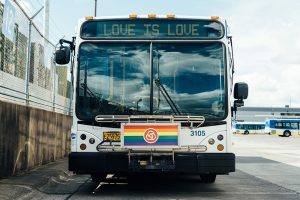 All MAX lines and more than a dozen bus lines serve Downtown Portland and will get you to the Pride events. The Pride Festival runs both Saturday and Sunday, June 18-19, at Tom McCall Waterfront Park. Two marches – the Trans Pride-March and the Dyke March – take to the streets on Saturday afternoon, from about 3 p.m. through 7:30 p.m. The Portland Pride Parade steps off Sunday morning at 11 a.m. through about 1:30 p.m. and is expected to draw about 50,000 people. Plan your trip using our online Trip Planner. Head downtown early. MAX lines may experience minor delays as trains hold at times during the parade and marches. Buses that intersect the routes also will stop at times and three bus lines – 17, 20 and 77 –will be detoured. Check trimet.org/alerts before you go. Portland Police Bureau is increasing security for the Pride events and Transit Police also will be adding patrols during the Pride Parade. If you see something suspicious, say something. Either alert a police officer, call 9-1-1 or tell a TriMet employee.